Manchester City will not let highly-rated Spanish left-back Angeliño go on the cheap, with the technical director of PSV Eindhoven revealing the Blues’ valuation of the on-loan youngster today. Brands was on FOX Sports‘ ‘De Tafel van Kees’ show and said PSV had been interested in signing Angeliño, 21, during the winter transfer window. The youngster has been impressive on loan at another Eredivisie club, NAC Breda, and was named the Eredivisie Talent of the Month for December, ahead of Ajax pair David Neres and Frenkie de Jong. And Brands said that Manchester City now value Angeliño in the €10million (£8.8million) to €15million (£13.2million) range, a considerable sum but a sign of the standard of talent now coming through the ranks at the Etihad. This amount proved to be far too much for PSV’s budget. Should a club meet City’s asking price this summer, NAC Breda will receive a small amount of the fee – thought to be up to 10 per cent – as part of their deal with City, a reward for helping develop the Blues’ young players. 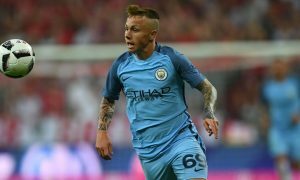 Angeliño could yet have a chance to enter Pep Guardiola’s plans, as his compatriot Pablo Maffeo may after a good loan spell with Girona FC, but with Benjamin Mendy, Fabian Delph and Oleksandr Zinchenko all options for left-back, there is a realistic chance the Spaniard may be sold on, potentially with a buy-back clause included.